At Wednesday’s special City Council meeting, Boulder City Mayor Rod Woodbury disclosed his past working relationship and current religious affiliation with a city attorney candidate and why the State of Nevada Ethics Commission said it was not a conflict of interest. Celia Shortt Goodyear/Boulder City Review Boulder City Mayor Rod Woodbury comments on the proposed agreement for the open city attorney position during Tuesday's City Council meeting. 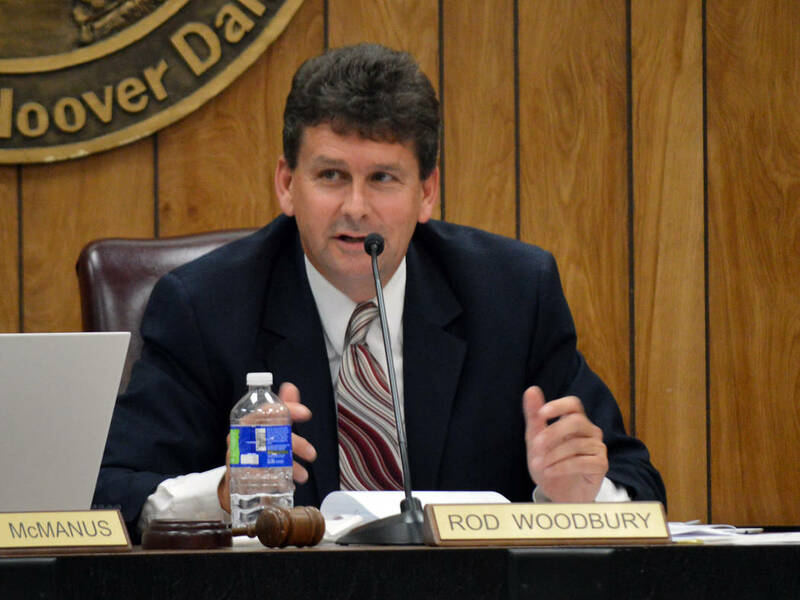 Woodbury disclosed that he was in a law firm from 2003-2011 with acting city attorney and city attorney candidate Steve Morris. They and two others were co-shareholders in the firm. In 2011, Woodbury bought out Morris and the other shareholders. At that point, Morris rented office space from him for a few months. Woodbury said that he had stopped renting that space by the end of 2011. Woodbury said that they have had no other business together since other than what needed to be done in terms of the shareholders breaking up the firm. He said that Nevarez-Goodson asked him if there was a substantial and continual interest in their working relationship and he said that he told her there is not one. He said that she told him that because there is not a continual interest, there is no conflict of interest. Residents had also brought Morris and Woodbury’s church membership as a possible conflict of interest, as both are members of The Church of Jesus Christ of Latter-day Saints. Woodbury said that Morris used to be a bishop in his congregation. Currently, he serves in a regional leadership position over congregations in Boulder City and Henderson. “He is not at my congregation as much anymore because of his regional duties,” he said. Woodbury also said that even if Morris were at church, they would not discuss politics because church is discussed there, not politics. “He does not have authority over me in political matters,” he said. Woodbury added that if Morris did try to counsel him there about political matters, he would stop him. He said that the only time he even discussed political matters with Morris was several years ago when he asked him that as assistant city attorney if he’d ever be interested in applying for city attorney. “He said yes, but he didn’t say he would apply,” Woodbury said. Woodbury added that he, Morris and their families are currently casual and occasional friends. Also no nonprofits Morris is involved with for the church have any business with the city, according to Woodbury. Woodbury said that Nevarez-Goodson told him religion does not factor into the situation and that according to the ethics commission, he did not have to disclose this relationship, despite him choosing to. “None of these things will influence my vote,” he said.